Bloch Wallpaper Changer Schedule when your desktop wallpaper changes with a user defined time interval. O in short: Schedule when your desktop wallpaper changes with a user defined time interval. You can choose jpg files when you are using microsoft active desktop and make your desktop icons transparent in Windows versions below XP. A vivid and creative desktop to replace windows desktop. The desktop is like pure water of lake. Raindrop fall down. Fish swim. Specially it's interactive. In addition there are more than 30 kinds of slide in it. Access 20,000+ awesome wallpapers for your desktop in a single click. Wallpapers Bot collects popular photos and images from various sources. The total number of desktop backgrounds in the Wallpapers Bot database is more than 20,000. Control Your Desktop! Build your wallpaper collection and manage it like a pro.Automatically watch for new pictures, create a list of favourites, email wallpaper to friends, set hidden or transparent icons, preview on desktop, print your wallpaper. 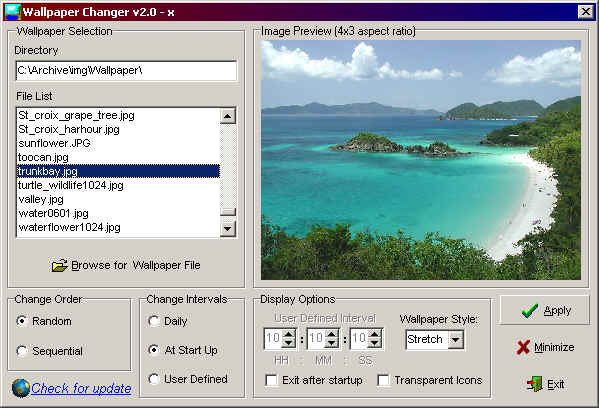 See above information and user's reviews about Bloch Wallpaper Changer Schedule when your desktop wallpaper changes with a user defined time interval.